While this place was nice, we have stayed at much nicer resort style places like in Hawaii and never paid $ 500.00 plus per night like we paid here. This is too expensive for what you get. They hand cuff you with the pool drinks and food, $50.00 for a cheeseburger, hotdog, 2 cokes and lemonade, with no free refills. Too pricey, food and drinks at pool was way too expensive, $30.00/day to park car. As a young adult couple, my husband and I felt like the hotel was booked to the gills and we could not spread out in sunny areas around the pool. The bar staff was nice; the food was excellent, but very expensive. We had noisy construction under our room at St. Moritz and the front desk staff was happy to move us to another room. Due to the crowded nature of this hotel, we really didn't feel as though we fully relaxed during our six day stay. Loews south beach is total eye candy! Structurally appealing, the grounds/pool area is attractive. Good food. The pool area is far too crowded - my lounge chair was touching a stranger's chair. Could not enjoy pool. Too many kids. 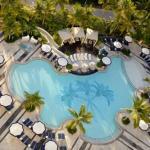 The Loews Miami Beach Hotel is perfect for anyone who loves comfort and attention to detail. The rooms are roomy and comfortable and come with flat screen TVs, cd player, cable, in room video games for the kids, coffee makers, 24 hour room service and much more. High speed Internet and meeting rooms are available if you are there on business or need to stay in touch with the office. And there is no need to worry about keeping your room neat, as there is twice daily room service available to keep you comfortable. If you can't stand being away from your pet, Loews hotels go out of their way to make your pet comfortable, even going so far as to provide you with local veterinary information. And your children will never be bored with lending libraries of games, special children's menus which include healthy options, tours, Fisher Price welcome gifts, supervised recreational programs and much more. There is also an oceanfront swimming pool and Jacuzzi and direct beach access so you can work on your tan. This is the perfect hotel to get all of your needs met. Roomy, clean accommodations await you here. Enjoy incredibly comfortable beds, the Ultimate Doeskin robe by Chadsworth & Haigrobes, flat screen TV, cd players, 24 hour room service,2 digital phone lines with voice mail, coffee makers, high speed Internet access, cable and pay per view and much much more. Lounge by the ocean side pool or use their direct access to stroll on down to the beach. There are even pool concierges to take care of your business needs while you lounge. There is also a spa on the premises and a fully functioning gym. Hungry? Indulge in one of four on site restaurants, including Emeril's Miami Beach. Or get your caffeine fix at the Sobe coffee bar. Or feel like going out? The hotel is only minutes from shopping, restaurants, and nightlife. It is only one block away from Lincoln road and three blocks from the Miami Beach convention center. You would be hard pressed to find a Loews hotel that didn't exceed your expectations. This hotel is no exception. If there is anything that you need, all you have to do is ask and their staff gets right on it. I mean how many hotels have pool side concierge services for your convenience? The pool is spectacular and the beds are so comfortable you may want to sleep in your first day. This hotel gets our top marks. Pets: Yes, pets are allowed. The hotel welcomes pets and even has a welcome package detailing local pet services.